The term millennial was coined by Strauss and Howe in the 1980’s. It’s been used to describe everyone born between 1980 – 1994, post “generation x”. For a few years now, the needs of this audience have been widely debated and almost singled out for having unique needs when it comes to tech consumption and intranet usage. 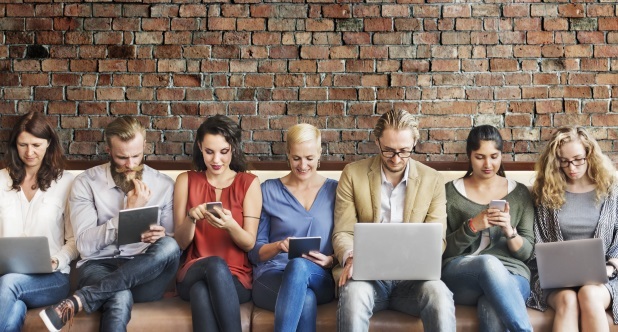 Here I explore millennial's intranet requirements and whether these differ from everyone else’s intranet needs and why that might matter. To find out how we can help your organisation's needs, book a demo with our intranet experts. They get frustrated if the user experience is drawn out, cumbersome and unnecessary. Streamlining clicks and making it easy for them to interact are all sure ways to get this group to adopt your intranet. If their company intranet can save them time by consolidating business processes, enabling quick people search and enabling them to do all of their work admin such as booking leave, rooms, equipment and even parking in one place, you are onto a winner with this group. This group are all about sharing ideas and working together. Finding, connecting and collaborating are the norm for this group. Their intranet must facilitate collaboration and enable discussion, recognition and social interaction. Increasingly this group blur the lines between work and personal life. Larger companies are providing personal services so colleagues can be more efficient with their time and also where they work. Millennials like to work where they feel comfortable, so working from home or elsewhere other than the office is the norm, so they need to be able to access the intranet remotely from wherever and whenever they need to. It’s reported that millennials are more brand loyal than the rest of us, they want to work for brands that fit their personal values. The organisational culture needs to be reflected through the intranet. Millennials like to use tech that they are comfortable with and that means your intranet must be accessible from any device. Are these intranet needs so different to the needs of every other user? I think everyone wants an intranet that does all of these things and more. The way we work today and consume and use technology is changing the way we work because of more complex factors than the year we were born. Maybe it’s time to stop highlighting this group as being so different and instead look at how the intranet can help connect all users of all abilities, ages and needs because isn’t that what intranets do best? Perhaps this is why millennial's intranet requirements matter because they highlight the needs of all us? I’d love to know your thoughts, please comment and share this post. If you would like to see how our SORCE intranet software can help connect your organisation please book a demo.